The Amorita Cup is one of the oldest team racing trophies in existence having first been sailed for in 1939 between the Royal Bermuda Yacht Club (now Bermuda team) and a United States team. The race was created to take place in the new International One Design boat. Frederick Hoyt, a renowned sailor from the Larchmont Yacht Club, deeded the Cup in 1937. However, it has laid dormant for the past several years and Bermuda is thrilled to start up this competition once again. The U.S. team comprises of Jim Bishop Jr. and Elliott Wisler (co-skippers), Jennifer Miller and John Evans. Jim Bishop Jr. is the son of legendary IOD and Bermuda Race sailor Jim Bishop Sr.. Jim Jr. has a ton of experience in sailing the IOD as does his co-helm Elliott Wisler who is a past IOD World Champion. Jennifer Miller has been a mainstay in the Long Island Sound Fleet and follows in her father’s footsteps in her commitment to sailing the IOD. She has a lifetime of experience in sailing these boats. The final American competitor is John Evans who splits his time sailing in North East Harbor and Long Island Sound. He recently competed in the IOD North American’s in Chester Nova Scotia and finished 3rd in the very competitive regatta. The Bermuda team comprises of veterans of our local fleet led by perennial fleet champion and international competitor Patrick Cooper. He is joined by Kevin Horsfield who will have a mix of youth and experience on his boat. The third boat will be helmed by Ray DeSilva the current Bermuda Fleet President. Ray also has international experience from his youth competing in the 470 representing Bermuda along with Blythe Walker. "The Bermuda IOD fleet is excited about renewing the Team Racing for the Amorita Cup against the Long Island Sound IOD Fleet. 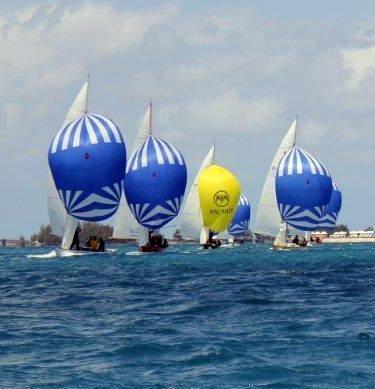 As the 2 original IOD class fleets we are continuing the tradition of team racing that started in 1939 when the Amorita Cup was first raced for in Bermuda", Bermuda IOD Spokesperson. Sailing starts at 11am in the Great Sound on Saturday October 13th and finishes on Sunday October 14th. The race format is 3 boats versus 3 boats and the best 4 out of 7 races will win the trophy. It should be a fun filled and exciting weekend for everyone.